New tweeter, new smaller bass/midranges, new crossover, new wiring, more subwoofer amp power, more cabinet bracing, and piano black finish. All these changes are described more fully in the first review, in Sound and Vision magazine. Here is a link. The reviewer considers the ONE.R as a smaller version of the REFERENCE for less money ($6000 vs $9000) and my short time listening to date agrees with him. It looks like the main difference will have to be in the maximum SPL . The smaller 5.25 in cone bass/midrange driver in the ONE-R might top out a lower SPL. The REFERENCE is spec’d to 12 Hz, while the ONE-R is 13Hz output (clearly insignificant) but because the REFERENCE has one more bass driver, bigger passive radiators, larger cabinet, and a little more powerful subwoofer amp it will surely move a bit more air. Frankly the original Triton Two did as much bass as I ever want, but there is always merit to more bass SPL capability. But do they sound the same? An audiophile friend who has heard the REFERENCE several times dropped by, and after a one minute listen said he preferred the ONE.R. My take is that he was just here when I was playing a good track: I need more comparison to decide. Right now I have a pair of the REFERENCE, the ONE, and the ONE.R in the room for comparison and will be swapping off. I know that many of you, my subscribers, have ears more golden than mine, so anyone who wants to help me decide the differences is invited to drop by and listen. I’m highly available; just email or call for a mutually convenient time. 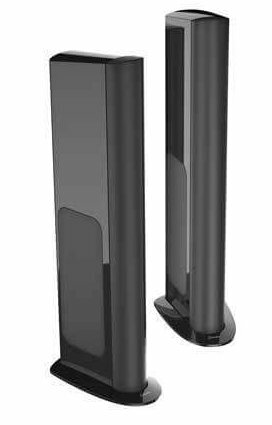 This entry was posted in GoldenEar Technology, Tower speakers, Uncategorized and tagged GoldenEar Technology Triton ONE-R, GoldenEar Triton One, GoldenEar Triton Reference. Bookmark the permalink.